This is an information website about the very peculiar experience of a business which was defrauded by a bunch of scammers who succeeded in their misdeeds only because of the unlimited greed of the company running the website www.globalsources.com. Are you a business from anywhere in the world about to decide where to advertise your products? Conversely, are you an international buyer trying to source reliable suppliers and products? 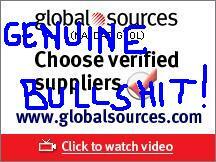 In either case, for your own sake, do not do it on Globalsources.com! The reason is very sound and simple: you may definitely risk your money and jeopardize the future of your company in case of bulky order confirmation. We are a business from Italy and within this website we are going to tell you our story with the pirate's nest and provide you with sound evidence about the fact it is better for you to stay away from the new "Tortuga". Also please make sure you do not miss the website section dedicated to FUJIYAMA TECH LTD www.fujiyama.cn (outright scammers)! You are welcome to read carefully the whole content of this article, contact us for additional information if you want, then draw your own conclusions. ..